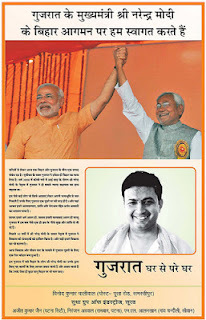 Nitish Kumar in an obvious reference to opposition to Modi’s possible projection as the Prime-ministerial candidate of NDA, in the next parliamentary elections said that NDA’s Prime Ministerial candidate should be one with secular credentials. His aide went on to say that Vajpayee had the intention of sacking in the wake of Gujarat carnage and the NDA lost 2004 Parliamentary elections due to the Gujarat carnage and role of Modi in the same (June 19, 2012). In response Lalu Yadav questioned Nitish as to how he, Nitish, continued to be part of NDA after Gujarat happened? The BJP spokesmen talked at various levels. One of them said that ideologically Vajpayee, Advani and Modi are all the same. Another one said that Hindutva is truly secular and liberal so why Modi cannot be the PM candidate. RSS Supremo Bhagwat buttressed the point by saying as to why the nation cannot have a Hindutvawadi prime minister? With this the ever continuing debate about secularism and the nature of Hindutva is in the social space once again. One concedes that Kumar is no secular angel. When BJP came to become the largest single party in Lok Sabha in 1996, no one dared to ally with it that time as it’s communal face was starkly obvious due to its role in Babri demolition and consequent violence, which was too fresh in people’s memory. By 1998 in a similar situation many parities including Kumar’s JD (U) could not resist the temptation of power and struck some minimum common program to share power with the BJP. Though his JD (U) had a common minimum understanding with BJP, right under Kumar’s nose BJP during NDA regime communalized the polity to no end. Saffronization of text books was done and introduction of courses like Paurihitya and Hindu Rituals in the Universities being just few examples of the Hindutva agenda, were starkly visible. When the carnage broke out in 2002, Kumar was the minister for railways and in that capacity he ignored the investigation of Godhra train burning, which was mandatory as per the rules. Due to this Modi’s concoction that train burning was a preplanned act by Muslims went unchallenged for a long time. Kumar could have called Modi’s bluff that the train burning was a planned act by Muslims. Nitish was part of the cabinet. What did he tell Vajpayee at that time one does not know, but as a secular person, his threat of pulling out from the Government would have set the house in order to a great extent. 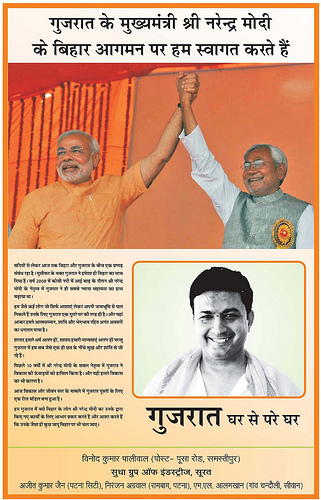 Even today, right under his nose his ally; the BJP of Bihar, is communalizing the polity. Communalism is not just communal violence. Communal violence is just the superficially visible part of the process of communalization, which aims to abolish secular space and liberal values. Some of the statements of BJP spoke-persons are partly true also. The claim that Vajpayee, Advani, and Modi (one can add even people like Praveen Togadia, Promod Mutallik, Vinay Katiyar and the likes) are similar, is true to a great extent. They are all ideologically committed swaymsevaks, (RSS trained Cadres) working for the agenda of Hindu Rashta, the goal of RSS politics. There are dissimilarities amongst them also; there is a division of labor amongst them also. Since BJP is not hoping for coming to majority on its own strength, it has to keep a liberal façade. Precisely for this reason Vajpayee was the prime Minister, while prime mover of the chariot of communalism through Ram Temple campaign, Advani, was forced to play the second fiddle. When Vajpayee withdrew from the scene, Advani decided for the image change over and he suddenly realized the secular worth of Jinnah. It is another matter that he overplayed the game and their patriarch, RSS, decided to clip his wings and demote him. All the top brass of BJP, VHP, Bajrang Dal, Vanvasi Kalyan Ashram and many other RSS outfits are primarily the RSS swayamasevaks, which is too well known by now. When the previous avatar of BJP, Jan Sangh, merged in Janata Party in the wake of lifting of emergency, the other components of Janata party, socialists in particular, demanded that the Jan Sangh members should give up their membership-affiliation with RSS. For Jan Sanghis breaking link with RSS was unthinkable and they decided to pull out from Janata Party and then they regrouped as Bharatiya Janata Party, as it is known at present. Vajpayee, in his famous address to NRI Indians in Staten Island, US, asserted that he is Swayamsevak first and anything else, PM, later. In that sense they are on the same ideological wavelength but playing different roles at any point of time. They are communal to the core, with the agenda to work for religion based nationalism. To say that Hindutva is secular and liberal is like putting the reality on its head. Hindutva is not Hinduism. Hinduism is an umbrella of various religious streams, which flowered and existed in this part of the world. Hindutva as a concept and political ideology started emerging during colonial period and was later popularized by Savarkar. He defined it as ‘Whole of Hinduness’, a combination of Aryan race, culture and language. In particular Hindutva is based on the Brahmanical stream of Hinduism, subtly promoting caste and gender hierarchy, reviving the feudal hierarchical system in the modern idioms. When the whole nation was coming together on the principles of Liberty, Equality and Fraternity, the upholders of Hindutva, coming from the sections of Rajas, Jamindars and section of upper caste Hindus kept aloof from the struggle against British. They came together as Hindu Mahasabha and later founded and supported RSS. Their politics was parallel and opposite of the politics of Muslim League, which was arguing on the similar line for an Islamic state, Pakistan. Muslim League also had base amongst the landed aristocracy, Nawabas, Jagirdars and later joined by educated elite. Hindutva stream, Hindu Mahasabha-RSS projected the glorious Hindu past and asserted we are a Hindu Nation from times immemorial. Muslim League identified with the rule of Muslim kings and traced their lineage to the first invasion of Muslim King in this part of the world. The National movement under Gandhi was for throwing away the yoke of colonial rule and for social change of caste and gender relations. It articulated that we are a Nation in the making. Here one can see the instrumentalist use of religion by a section of society, elite, who wanted to preserve their privileges in the changing social dynamics. The sharpest articulation of Hindutva politics came from M.S. 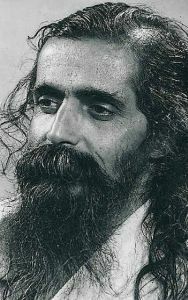 Golwalkar, who in his ‘We or our Nationhood Defined’, eulogized fascism and asked for a second class citizenship for Muslims and Christians. Today the RSS cadres unable to swallow the blunt formulation of their politics by Golwalkar deny the existence of this book. The dilemma of RSS and its progeny is to keep the democratic face till they come to a majority when they can unleash their full scale agenda. Currently also their trained swayamsevaks are infiltrating in different wings of the state, media and education apart from forming the organizations like BJP etc. So who is secular in BJP? They claim that they believe in justice for all and appeasement of none. This is a very cleverly worded sentence to hide their intention of continuing the discrimination of those suffering in the present scheme of things. How does one understand the difference between Hinduism and Hindutva? One has to take recourse to the example of the ‘father of the nation’ to avoid the heavy academic debates. Gandhi was a Hindu but not a follower of Hindutva. Godse and the RSS tribe are the practitioners of ‘Hindutva politics’. For this politics a Hindu like Gandhi is unacceptable ideologically as he could reach the zenith of secular ethos while being the best of the Hindus! We do realize that while the statement by Nitish Kumar is a symbol of shadow boxing it also presents one of the aspects of the political reality being witnessed by the nation.